Growing infrastructure sector to keep up with the increasing population of the country coupled with rise in commercial and manufacturing sectors are some of the key factors to drive the growth of Uninterruptible Power Supply (UPS) market in Vietnam. Also, inflow of FDI in industrial and manufacturing segments is further expected to improve the market for UPS. Further, increasing IT infrastructure, need to provide power back up and rising number of data centers would spur the market for UPS in Vietnam. Amongst all the applications, the commercial sector captured the highest Vietnam UPS market share in 2017. In the commercial sector, data centers, BFSI and hospitality segments were the major revenue shareholders and are expected to maintain their dominance over the coming years on account of government emphasis on developing the social infrastructure of the country. The Southern region is projected to witness highest growth rate over the next six years due to various upcoming infrastructure projects in the region. Additionally, the Northern region also provide positive prospects for the deployment of UPS systems in the region. Further, development of Special Economic Zones (SEZ) in provinces such as Quang Ninh are expected to create additional opportunities for the UPS companies in the Northern region. Some of the key players in Vietnam UPS market includes- Eaton, Schneider Electric, General Electric, ABB, Socomec, Tripp Lite and others. 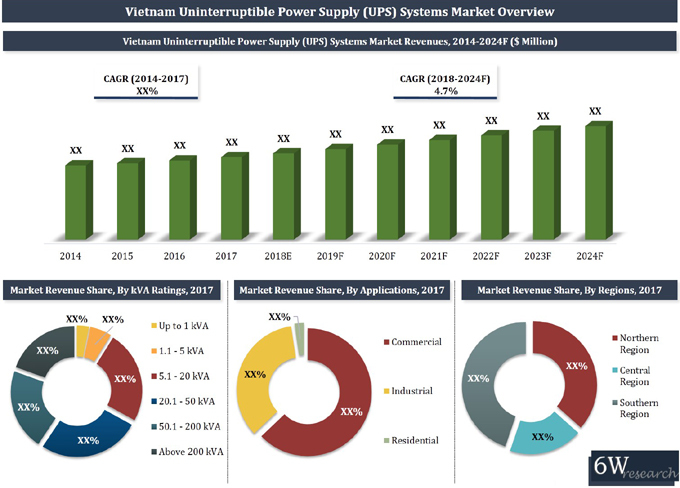 The Vietnam UPS market report thoroughly covers the Vietnam Uninterruptible Power Supply (UPS) Systems market by KVA ratings, applications and regions. The Vietnam UPS market outlook report provides an unbiased and detailed analysis of the Vietnam UPS market trends, opportunities/high growth areas and market drivers which would help the stakeholders to device and align their market strategies according to the current and future market dynamics. 13.8. Riello UPS Singapore Pte. Ltd.
13.9. Socomec Asia Pacific Pte. Ltd.